Using MEDLINE, a non-systematic review was performed including articles between January 2000 and February 2016. English language original articles, reviews and editorials were selected based on their clinical relevance. UTUC accounts for 5–10 % of all urothelial cancers, with an increasing incidence. UTUC and bladder cancer share some common risk factors, even if they are two different entities regarding practical, biological and clinical characteristics. Aristolochic acid plays an important role in UTUC pathogenesis in certain regions. It is further estimated that approximately 10 % of UTUC are part of the hereditary non-polyposis colorectal cancer spectrum disease. UTUC diagnosis remains mainly based on imaging and endoscopy, but development of new technologies is rapidly changing the diagnosis algorithm. To help the decision-making process regarding surgical treatment, extent of lymphadenectomy and selection of neoadjuvant systemic therapies, predictive tools based on preoperative patient and tumor characteristics have been developed. Awareness regarding epidemiology, diagnosis, preoperative evaluation and prognostic assessment changes is essential to correctly diagnose and manage UTUC patients, thereby potentially improving their outcomes. Thalmann GN and Shariat SF were involved in protocol/project development; Soria F, Shariat SF, Lerner SP, Fritsche H, Rink M, Kassouf W, Spiess PE, Lotan Y, Ye D, Fernández MI, Kikuchi E, Chade DC, Babjuk M, Grollman AP and Thalmann GN were involved in data collection or management; Soria F, Shariat SF, Thalmann GN, Data analysis; Soria F, Shariat SF and Thalmann GN wrote the manuscript; Soria F, Shariat SF, Lerner SP, Fritsche H, Rink M, Kassouf W, Spiess PE, Lotan Y, Ye D, Fernández MI, Kikuchi E, Chade DC, Babjuk M, Grollman AP and Thalmann GN wrote and edited the manuscript. I certify that all conflicts of interest including specific financial interests and relationships and affiliations relevant to the subject matter or materials discussed in the manuscript are the following: Shahrokh Shariat owns or co-owns the following patents: Methods to determine prognosis after therapy for prostate cancer. Granted 2002-09-06. Methods to determine prognosis after therapy for bladder cancer. Granted 2003-06-19. Prognostic methods for patients with prostatic disease. Granted 2004-08-05. 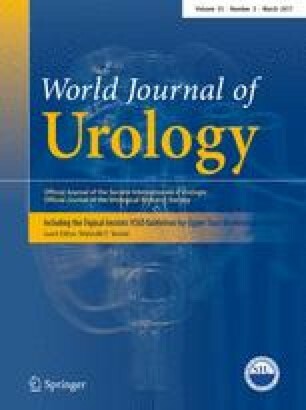 Soluble Fas: urinary marker for the detection of bladder transitional cell carcinoma. Granted 2010-07-20. He is advisory board member of Astellas, Cepheid, Ipsen, Jansen, Lilly, Olympus, Pfizer, Pierre Fabre, Sanofi, Wolff. He is speaker for Astellas, Ipsen, Jansen, Lilly, Olympus, Pfizer, Pierre Fabre, Sanochemia, Sanofi, Wolff. This study was conducted according to the Declaration of Helsinki.